You may not realize it, but our forests are indeed important. 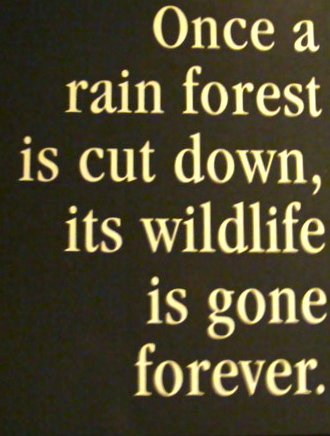 I went to the Bronx Zoo yesterday and saw this sign next to many pictures of African rainforest being cut down in the Rainforest exhibit and then I thought to myself-“I see this happening, but what can be done?” Humans today do not see the danger and their inhumane doings. For example, plastic! It is a big deal and where does everyone think it is going? I see my step grandma go through boxes of Ziplock bags when there are Tupperware’s right in front of her. Doesn’t she realize that plastic is not biodegradable and that you cannot just burn it and then it would just disappear? Society is going through a downhill whirlwind. ONE PERSONS DECISION TO CHANGE CAN MAKE A DIFFERENCE!!! Next What motivates you to read?